For Easter, I was responsible for bringing dessert. I wanted to make something that felt like an Easter dessert without it being overly sweet. 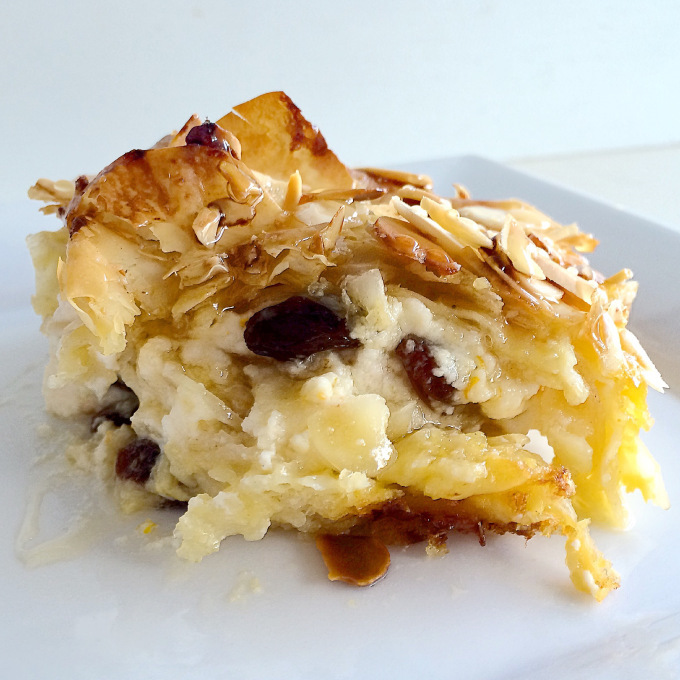 The result was phyllo pastry layered with orange scented ricotta, honey, rum soaked raisins, almonds, and soaked in a honey vanilla custard and topped with crunchy almond slices. The top gets golden and a drizzle of honey for a bit more sweetness is the perfect finish. This pie is great for a big group, and the left overs won’t last long. You can also eat it straight out of the oven or at room temperature. Use a glass dish to make this pie. I used an oval dish but you can use a pie or square dish. If using a large casserole dish, double the recipe. Put the raisins in a small bowl and cover with 1 tablespoon of dark rum, let soak for 10 minutes. In a bowl, add ricotta, orange zest, and 2 tablespoon of honey. Mix well. Line your dish with 2 pieces of phyllo, making an even layer on the bottom of the dish. Let the the phyllo come up and over the sides of the dish. Drizzle 2 tablespoons of melted butter over the pastry. Tear up 2 -3 phyllo sheets and scrunch them up and place them loosely in the dish. Drizzle some more butter over the phyllo. Spoon half the ricotta mixture onto the phyllo. Sprinkle half the raisins and almonds. Add another layer of torn up phyllo, drizzle more butter, add the rest of the ricotta, raisins, and almonds. Take 2 -3 sheets of phyllo and scrunch them up and cover the top. Fold the phyllo hanging over the sides into the dish. Drizzle the remaining butter over the phyllo. In a bowl, beat the eggs, milk, vanilla, 2 tablespoons of honey, and the remaining rum from the raisins together. Pour slowly onto the pie, letting it soak in and cover everything. Let sit for 30 minutes. Sprinkle some sliced almonds over the pie. Bake the pie for 30 minutes. When it’s ready, the pastry will be golden and puffed up, and the inside set. Let it stand for 10 minutes, then drizzle some honey over the top. To cut, use a sharp knife. Run the knife around the edge of the dish and then cut into portions. Have additional honey set out for drizzling. The nice thing about this dish is that it is not too sweet so everyone can control the sweetness. Some people don’t add extra honey, others drench it. Either was it is delicious.